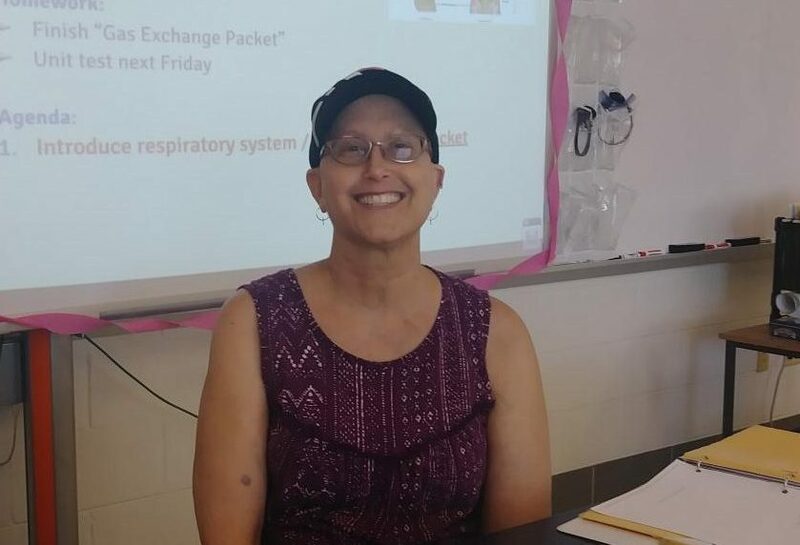 IB Biology teacher Lauren Wilkinson comes to work every day as she fights off Stage IIA breast cancer. “Many adults and students come to school each day facing invisible challenges. My challenge just happens to be visible,” science teacher Lauren Wilkinson said. Wilkinson has an invasive ductal carcinoma, which is an aggressive form of breast cancer. It is currently at stage IIA, which typically has a good prognosis. Last March, she had a mammogram that was benign, in which there was no sign of cancer, but in September, she found a suspicious lump that happened to be cancerous. “My teaching commitment is more than a ‘job’ to me… I want to be a good role model for my students and show them that education is so important that we need to do our best to continue the course in the face of challenges,” Wilkinson added. She decided to continue teaching at Watkins Mill instead of taking leave. Wilkinson will continue teaching as long as she is strong and well enough to do so. Each year, she makes a commitment to her students to build relationships with them and support their learning of the curriculum. Wilkinson “is one of the hardest working people [in Watkins Mill],” science teacher Laura Davis Vaughan added. 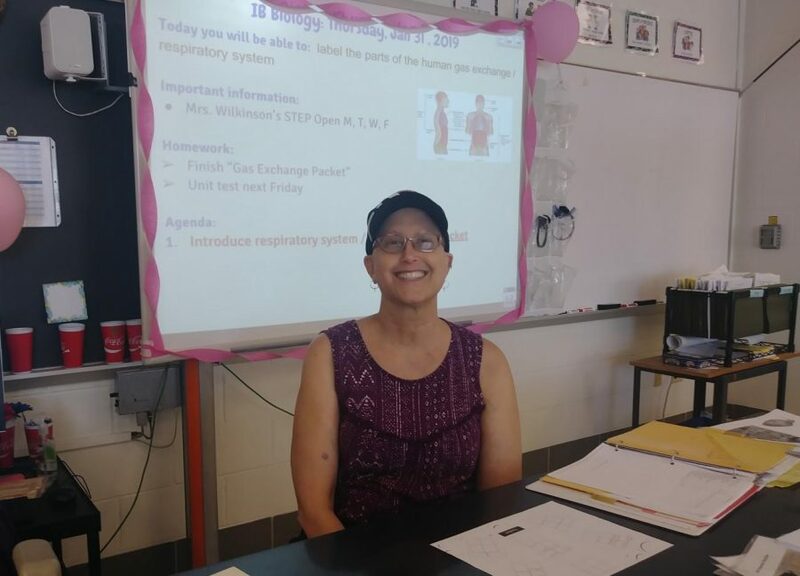 During breast cancer awareness month, some of Wilkinson’s IB Biology students suggested that their class wear pink on Wednesdays, which started “Wilkinson Wednesdays.” She was going through the process of diagnosis around this time. “My favorite part about [Wilkinson Wednesdays] is seeing everyone supporting her as a teacher,” senior Mia Zuniga said. The class also pitched in and gave Wilkinson gifts such as a breast cancer teddy bear, a pink lab coat, and decorating her classroom. “I think all of [Wilkinson’s] kids are what’s driving her to become strong and come to work,” Davis Vaughan added. “The teachers in the science department and administrative staff have been very supportive as well,” Wilkinson added. Davis Vaughan sends her text messages and notes that students have written to her asking about how she’s doing whenever she needs to be out. Wilkinson wants her students to take care of their bodies to minimize their chances of getting cancer. “Regular exercise, maintaining a healthy weight, and eating a healthy diet is the recommendation,” Wilkinson added, which her doctors told her are important life habits that help prevent cancer. Mrs. Wilkinson, you probably don’t remember me but I graduated in the class of 2007 and was in the same class with Daniel Ankrah. Your story popped up in my feed and I it stopped me in my tracks. You are one of the few teachers that I vividly remember with your teaching style and compassion to help a student learn the subjects…..I was in your honors Bio class. I am now a nurse, and I understand the significant role that cancer and the healing process has on the family. I am sending prayers and warm hugs from a former student of yours. Fun fact: I would always know your which car was yours in the parking lot because of the Damascus Hornets magnet on the back….truly wishing you all the best.